Fed up with deciphering jargon, Dr Attiya Khan asked consultant gynaecologist Mr Rehan Khan for a plain language guide to understanding pelvic ultrasounds. How many times have you seen a report like this (see below) and thought: 'What on earth does this mean?' What are the normal measurements for the uterus? How do I know when the endometrium is significantly thickened? At what point do I refer to a gynaecologist? The uterus is anteverted and appears bulky in size, shape and echopattern. It measures AP diameter 41mm and uterine length 79mm. 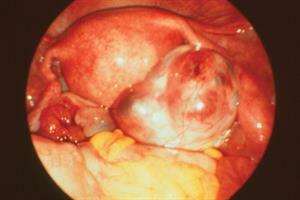 Two small anterior intramural fibroids measuring 14mm and 16mm are seen. The endometrium appears smooth and regular measuring 6mm. Last menstrual period one to two weeks. The right ovary measures 33mm +/-19mm. The left ovary measures 36mm +/20mm and contains a collapsed corpus luteal cyst measuring 20mm. Moderate free fluid in the pouch of Douglas most likely post-ovulatory but PID cannot be excluded. I have thought this a few times, so I decided to acquire some expert advice from a consultant obstetrician and gynaecologist on finding a way through the jargon. The position describes whether the uterus is anteverted (tilting forwards) or retroverted (tilting backwards) or axial (inbetween). Around 80 per cent of the time the uterus is anteverted and 20 per cent of the time it is retroverted or axial. A retroverted uterus is usually normal but if discovered on a scan it is important to correlate it to the clinical picture. In patients presenting with chronic pelvic pain and dyspareunia, the retroversion may be as a result of adhesions from chronic PID or chronic endometriosis. These figures are increased in women who have had children and decreased in postmenopausal women. A uterus is almost never abnormally small. Uterine enlargement is nearly always due to fibroids, and, if possible, the sonographer will measure each one and describe their position as submucosal (within the cavity), subserosal (outside the cavity) or intramyometrial (within the wall). This description is important when considering an IUD or IUS because submucosal fibroids may cause a coil to be expelled. Fibroids do not usually need referral unless they are causing symptoms, such as bleeding or pressure symptoms. In addition to changes caused by fibroids, the uterus may have varying shapes because of embryological abnormalities. The clinical implications will depend on the patient's presentation, and may include menorrhagia, amenorrhoea, subfertility and recurrent miscarriage. Echotexture and echopattern describes the ultrasound appearance of the myometrium. For example, the description may be 'normal', 'suggestive of fibroid change' or 'suggestive of adenomyosis'. 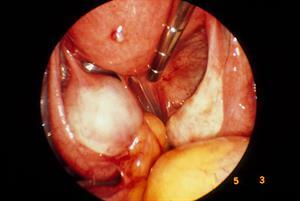 The normal appearance of the endometrium is smooth and regular versus a disrupted appearance. The appearance and thickness of the endometrium varies with different stages of the menstrual cycle. As with the uterus there are subjective comments about the appearance of the ovaries and then objective comments about the size, shape and echotexture are made. The average normal size is 3.5cm x 2.5cm x 1.5cm. After menopause the ovaries generally measure 2cm x 1.5cm x 1cm or less. There may be cysts present on the ovaries. These may include follicular cysts, corpus luteum cysts, haemorrhagic cysts, endometriomas, simple cysts and polycystic appearing ovaries. Cysts >5cm will need onward referral as they are associated with an increased chance of ovarian cyst accident. Symptomatic cysts in the premenopausal woman also merit referral. In the postmenopausal woman any new cyst needs referral in order to exclude malignancy. It is reassuring if ovaries cannot be seen on scan as this excludes pathology. Tubes are not usually seen - if visible there is usually pathology, such as hydrosalpinx. Fluid in the pouch of Douglas can be measured. Its presence is usually physiological from a ruptured follicular cyst, but it may also be associated with a ruptured ovarian cyst or PID. 1. Eberhard Merz. Ultrasound in Obstetrics and Gynaecology. Vol. 2. 2nd edition, Thieme, Texas, 1997. 2. Goldberg BB, McGahan JP. Atlas of Ultrasound Measurements. Elsevier Health Sciences, Philadelphia 2006. 3.SIGN. 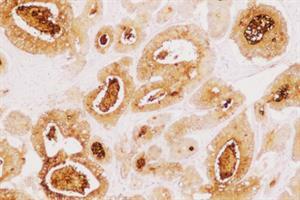 Investigation of post-menopausal bleeding. SIGN guideline 61, 2002.